Every time I eat apricots, I think of my childhood pet, Apricot. She was an apricot-colored miniature poodle. I called her Apricot because she was, well, apricot...and I'm a writer. In my defense, though, I was only 6 years old when I named her. Also, for those of you who think poodles are sissy dogs...you might be right. But they're also hypoallergenic for people like my mom who had a sensitivity to most breeds' fur and dander. I was just an elementary school kid who was very happy to have a dog at all. Apricot was my best friend until she passed away many years later while I was off at college. Maybe that's why I don't eat apricots all that often. So sad. Apricot. But these apricots are sun-dried, packaged in bright colors, and flaunt fun graphics and a whimsical font—one of the most cheerful-looking products I've seen in a while. There are three sections that break apart for easy travel with a peel-away top. 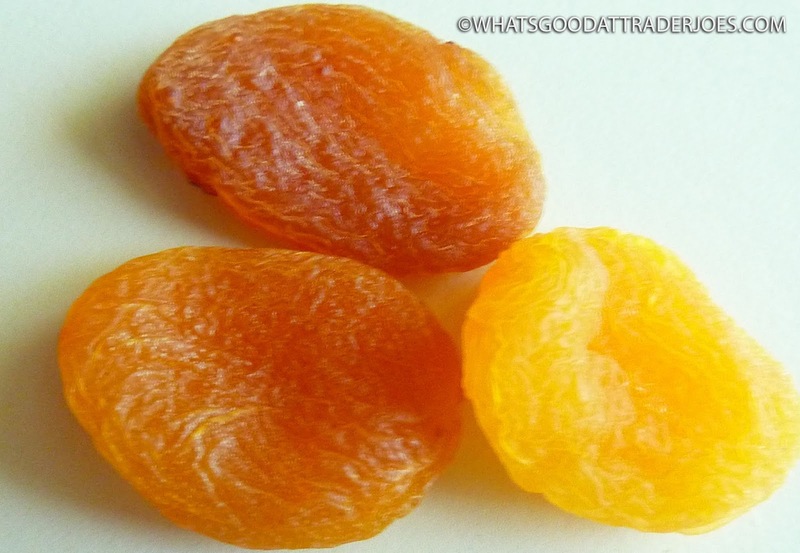 Each little container has about 8-10 dried apricots, each roughly the size of a quarter. And to be honest, the packaging is the best part of the product. Most of the apricots look pleasant enough, but Sonia and I both immediately observed that they're a bit more leathery than other dried apricots we've had. 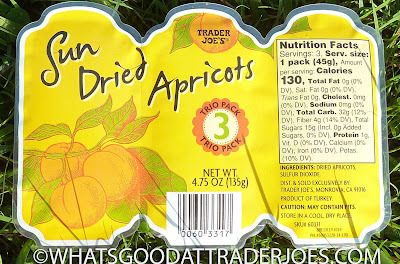 I know dried apricots tend to be a tad chewy, but I felt this offering was just a little too tough—not to the point where they were hard to chew once you had a piece in your mouth, but tearing off sections felt a bit too much like eating stiff beef jerky. Flavor-wise, they were plenty sweet. There was nothing unpleasant about the taste at first, but we both agreed there was a slight odd aftertaste, almost as if there were a little too much of the "sulfur dioxide," which I assume is there as a preservative. The three sections are super-convenient, and the price is reasonable at $1.49. If you need a blood sugar boosting snack that will easily fit in a small pocket, this isn't a bad product to reach for. We just can't tell you we were madly in love with these apricots. Three stars a piece here. Those would make nice treats for a chocolate fountain when you don't want to take out the entire box of Apricots. Also jams too! Cooking with those can be great and separating 3 segments for different applications. I don’t love that it’s additional packaging for a product they *already sell* in a larger bag.... i feel like TJs shoppers are generally clever enough to take things from a larger container and put in a smaller container themselves, hopefully something reusable. 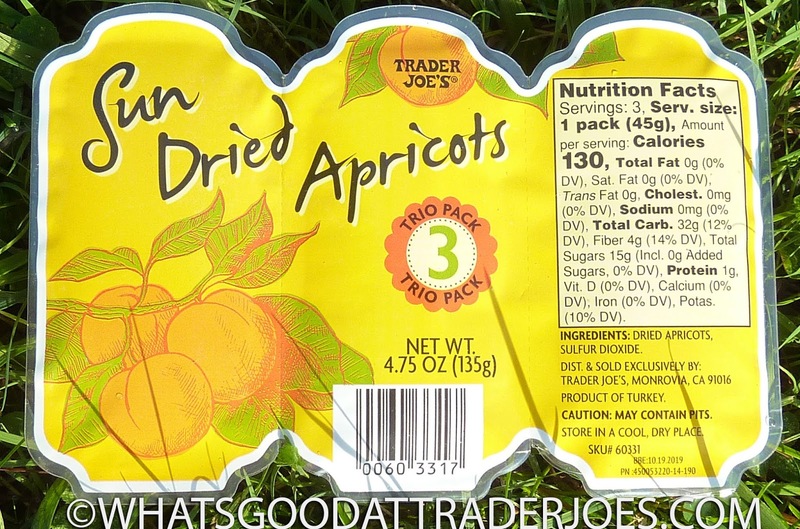 I don’t buy dried apricots very often but when i do it’s the slab blenheim apricots from CA that TJs has- they’re a bit more expensive yet taste like the soft chewy most apricot flavor ever.